Today, we celebrate the greatest event a human has ever encountered-the Resurrection from the Dead. You may think this is odd, but on this Day of Days, I want to write about loneliness in the spiritual walk. For a celibate, such as a priest, brother, nun, or sister, this call to loneliness is a vow, a special relationship with Christ, in the mystery of His Passion and Death. For the lay person, who finds himself or herself alone in the world for whatever reason, this denial of intimacy is a Cross which will lead to the Resurrection. That loneliness is a cross, a suffering, cannot be denied. For the widow or widower, or those who experience unrequited love, this loss of the beloved is a daily pain of the heart. However, on the road to perfection, such a gift of loneliness can be transformed into the path of NADA, the nothingness, of St. John of the Cross. Why on this day of Resurrection do I write of loneliness? Because the denial of intimacy can lead to the freedom of attachments and the all-encompassing love, which is a Person. There is no vain selfishness in loneliness. It just is. The ego is reduced to a longing unfullfilled and emptied of expectation. One's natural tendency for intimacy is reduced to ashes. There is no consolation in this world, none. Loneliness and the lack of intimacy is real death. But out of death comes the Resurrection. Out of the denial of one's real human need comes a shoot of life. The will dies and is replaced by the Divine Will. The heart dies and is replaced by the Divine Heart. St. John writes, "How shall hinder God from doing His own will in a soul that is detached and self-annihilated?" What can compare with the Love of God, Who is God? Ultimately, one is transformed by this Love. 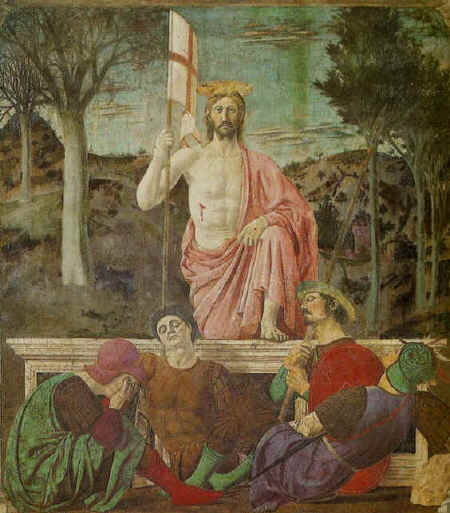 Such is the transformation of the Resurrection. Could Love experience more Love? Could Christ be more than He is or was before the Resurrection? NO. But, He has shown us the way as He came back into His full glory, with a glorified Body, which we shall see at the end of our own days on earth. How do we explain this, as God lived in Time, as the Incarnate God? Just as God matured from being an infant to a child to a Man, so He returns to us with His Glorified Body. Such is our hope-- Behold, I tell you a mystery. We shall all indeed rise again: but we shall not all be changed. In a moment, in the twinkling of an eye, at the last trumpet: for the trumpet shall sound, and the dead shall rise again incorruptible: and we shall be changed. For this corruptible must put on incorruption; and this mortal must put on immortality. And when this mortal hath put on immortality, then shall come to pass the saying that is written: Death is swallowed up in victory. O death, where is thy victory? O death, where is thy sting?